We take care of estate administration. There’s a family just like yours behind every single estate. That’s why we handle each estate with the utmost care. Our proactive, transparent approach means that you can rest assured we’re always on top of what needs to be done. We go the extra mile for our families. Our sole purpose is to help families move on. We do everything in our power to support and empathise with those who entrust us to take care of their estate administration. We understand that every estate and family is different so we go the extra mile to take care of everything that's involved within the estate administration. We're experts in estate administration. Estate administration is all we do, every day, and our tax and legal teams have the expertise to advise on any situation. We know how to handle intestacy, locate missing beneficiaries, deal with foreign shares and reseal a Grant of Probate. We have an abundance of experience when it comes to dealing with the DWP and HMRC. We'll pay your inheritance quickly. We’ll do everything we can to deal with the estate efficiently. We'll distribute the assets as soon as possible so you and your family receive your inheritance quickly. Wherever possible, we will make interim payments to all the beneficiaries so you don’t have to wait until the end of the process. When it comes to estate administration, we handle everything with empathy, expertise and efficiency. We'll take care of all the tasks you can think of and all of the things you might not have considered. When someone close to you dies, it can be difficult to work out what to do next. There are a number of tasks that need to be considered. 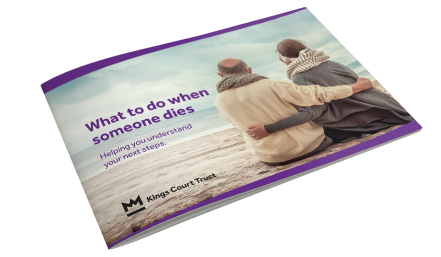 Our 'what to do when someone dies' guide, talks about these tasks and the next steps involved.